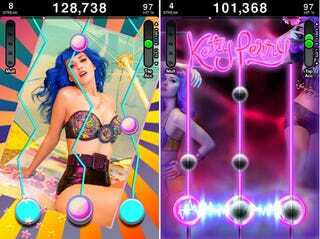 The latest celebrity to have their work and likeness pasted into the Tap Tap Revenge iPhone gaming template is Katy Perry, with Katy Perry Revenge now up for download on iTunes—if you ever listen to Katy Perry on purpose. The game is the standard Tap Tap Revenge rhythm action (Guitar Hero clone) affair, featuring all of Perry's famous songs. Like I Kissed A Girl and... other famous songs. Has she had any other songs? If so, they'll be on here.